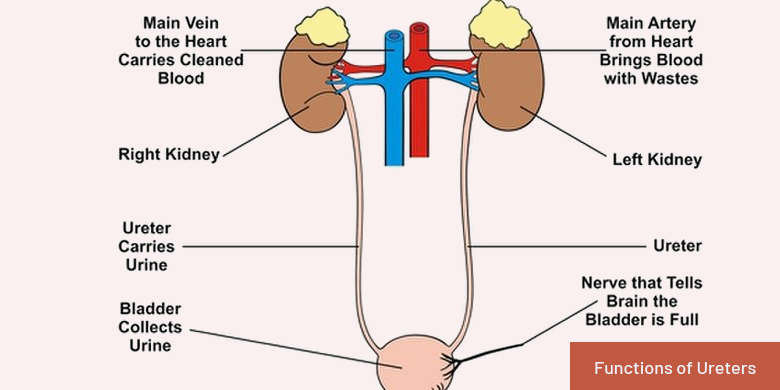 Two parallel running urinary tubes that connect left and right lobes of the kidney to the urinary bladder. Measuring about one foot (12 inches) in length, they assist in the excretion of waste fluid collected from the body in the renal pelvis. Injuries and some other disorders of the organ may lead to severe complexities in the region that can however be treated with the help of medications, and radiation or surgical therapy. 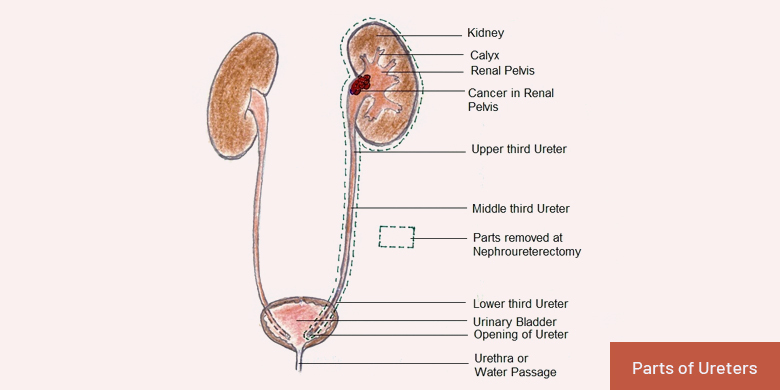 The narrow interior or lumen of ureter may reach up to 4 millimeter in diameter. There are different types of muscle fibers in the body, viz. cardiac, skeletal and smooth muscles that make the lining of various organs in the body. In case of ureter parts, the walls are made up of smooth muscle fibers that not only give them greater amount of flexibility, but also facilitate the generation and propagation of peristaltic movements. Pyelum or renal pelvis is the funnel shaped region at the medial aspect of each kidney that allows the smooth transfer of urinary fluid. This is the point where two or three calyces converge and mark the beginning of proximal end of the ureters. At the point where these cylindrical structures open into the fundus of the bladder, there is a valve, called ureterovesical junction that prevents the backflow of urine. 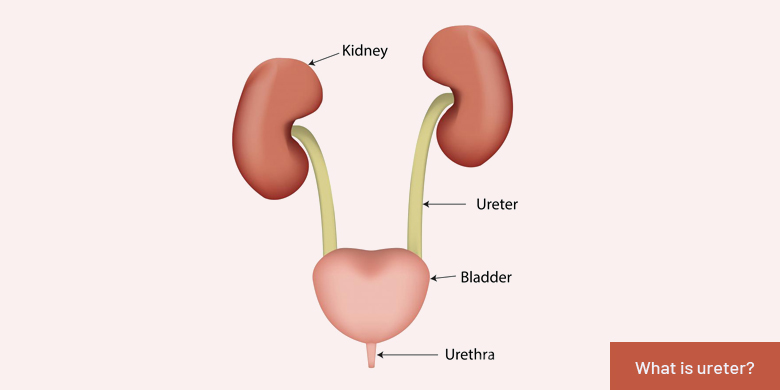 Their primary ureter function is to connect kidneys and bladder which are two out of four major organs of your excretory system and transfer urine from the former to the latter through hollow cylindrical tubes. The fibrous, mucus and muscular coats in the lining of ureters play a significant role in the flow of excretory fluid through them. Another function of these tubes is to ensure the unidirectional flow and prevent the backward movement of urine. This function is owed to the presence of ureterovesical junction (UVJ) at the distal end of each ureter that contains detrusor and ureteric muscles. The smooth involuntary muscles contract about five times in a minute at any point along the tubes and produce peristaltic movements for pushing the fluid downwards. In each spurt, about one and a half teaspoonful of urine descends under the influence of gravitational force and enters the storage organ only to be eliminated later on through urethra. The medical conditions associated with the ureters are known as the disorders of the excretory system. Stones, infections and injuries are among the common abnormalities of the urinary tubes that may lead to severe symptoms in the victims. 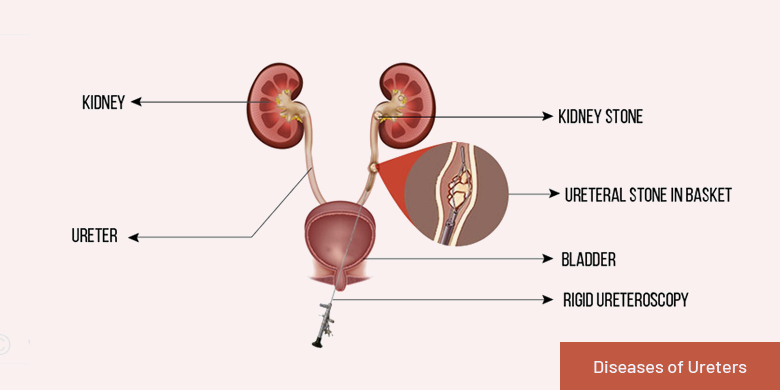 The UTI (Urinary Tract Infection) is characterized by the stagnation or backflow of urine and involves the clinical manifestations, like pain, burning sensation, frequent urination, fever, and foul smelling & reddish urine. The formation of stones usually takes place in the valves, like ureterovesical junction, that obstruct the passage of urine. They can be diagnosed with the help of x-Ray or cystoscopic examination and your health care provider may opt for either medications or surgical therapy as an effective treatment measure depending on the severity of the condition.